BRASÍLIA, BRAZIL – Police in Brazil have released the country’s top Google executive following his detention for not taking down Youtube clips that violated Brazilian law, Globo reported. 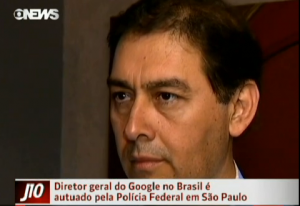 Fabio Jose Silva Coelho, Google’s head of Brazilian operations, was detained Wednesday after a Mato Grosso do Sul election court ordered Google – which owns Youtube – to remove clips that criticized a Partido Progressista (Progressive Party, PP) mayoral candidate for Campo Grande, Alcides Bernal, for his involvement in an alleged paternity suit. Fabio Jose Silva Coelho, top Google executive in Brazil was released following his detention for not taking down Youtube clips that violated Brazilian law, image recreation. A police spokesperson said that Mr. Coelho was released after agreeing to appear in court at an as yet undetermined date, Estadao reported. Brazil has strict electoral laws that prevent much public criticism of political candidates, a system that some commentators say are out-dated. Mr. Coelho’s detainment came shortly after another Brazilian court on Tuesday ordered Google to take down the trailer for “Innocence of Muslims”, a controversial anti-Islam film that has sparked deadly protests worldwide. The National Islamic Union, a Brazilian Muslim group, brought a lawsuit against Google to a São Paulo state court, claiming it was hosting video footage that was offensive and violated freedom of religion – a constitutional right in Brazil. Google has reportedly responded to the orders with claims that it is not responsible for the content on its websites uploaded by third-parties. “Being a platform, Google is not responsible for the content posted on its site,” the company said in an emailed statement.